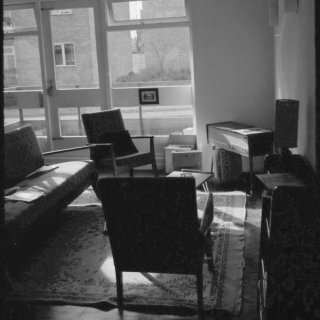 My Manchester flat in 1968 including a state-of-the-art "stereogram" - my entire album collection including all the Dylan albums up to John Wesley Harding was stolen in May 1968! This yearly page now contains only the main Rarities List! Mono 7" Singles & EPs (up to 1976) are now here, and Promotional Items (Albums and Singles) are now here. All Honourable Mentions are now here. 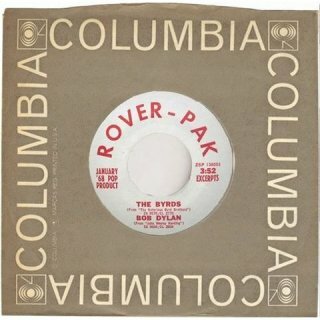 Columbia/Rover-Pak ZSP 136002 (USA) - A-side picture from eBay (no Dylan) This 7" mono promo EP contains excerpts from four current Columbia albums. 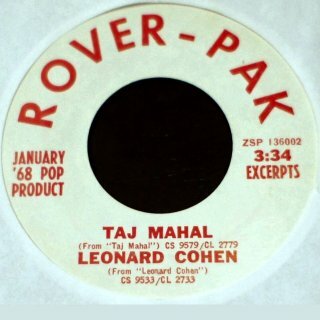 The A-side has excerpts from tracks by Taj Mahal and Leonard Cohen (Suzanne), the B-side has excerpts from tracks by The Byrds (Goin' Back) and Bob Dylan (Drifter's Escape). Tim Dunn has timed the track at 2:37 with a spoken intro of 0:16, making the excerpt 2:16. The complete mono track is timed at 2:50 on singles and 2:47 on the 2010 mono CD. Thanks to Tim Dunn, Keith Venturoni and Manuel García Jara for information and scans. R-0545 and R-0546 have now been released in Nov 2014 on The Bootleg Series Vol. 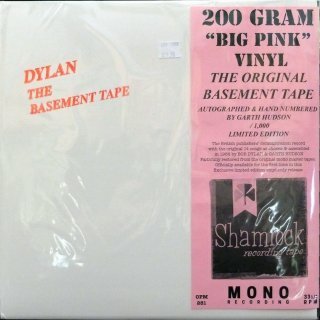 11 - The Basement Tapes Complete, so are no longer rarities. 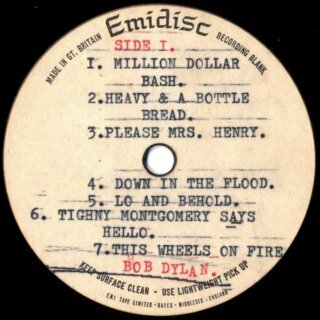 All other tracks on these test pressings (shown on the label listings) were released on The Basement Tapes in 1975, on Biograph in 1985, or on The Bootleg Series Vols. 1-3 in 1991, although these are mono versions. 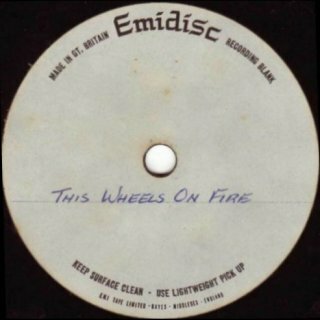 The Emidisc UK 14 track acetate/test pressing LP (five copies of which are shown with different text, two typewritten, three handwritten) is reputedly the source of the songs made available to UK groups such as Manfred Mann (The Mighty Quinn), The Brian Auger Trinity/Julie Driscoll (This Wheel's On Fire), Fairport Convention (Million Dollar Bash), etc. Apparently only about ten copies were pressed. John Bauldie describes this 14 track LP in detail in his article "The Basement Tapes" in "Record Collector", Jul 1987, but Hans Seegers disputes its legality. 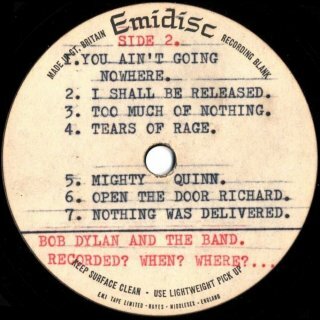 Hans says the songs were only legally distributed on tape, which is confirmed by Dean Chambers, who has information the songs were supplied to the music publishing company Feldmans in London on a 7" reel by Albert Grossman. 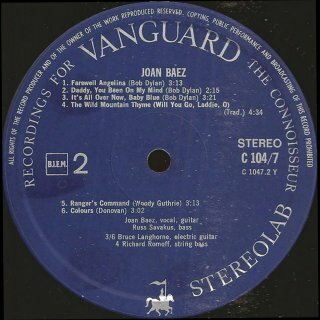 However, several acetates/test pressings were indeed made from this tape for private distribution, and these were the source of the much poorer quality bootleg LPs that surfaced. 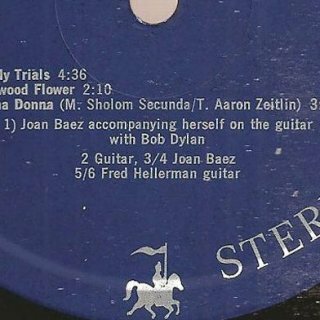 The US test pressing from Arie de Reus has exactly the same track list and appears official. Arie's UK LP is a double-sided acetate - a metal disc with a shellac coating on both sides, with the recording cut into each side, not pressed. 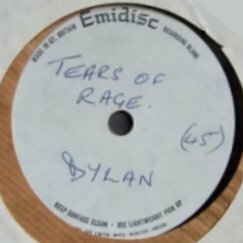 The UK test pressing with the yellow/black IBC labels found by Gerd Rundel is double-sided with all the tracks listed on Side 1, and the Side 2 label blank. The test pressing listed as variant 5 belonged to Brian Jones of the Rolling Stones, and was given by him in 1967-68 to a woman who worked as Fan Club Secretary for the band from 1964 to 1972, and is now selling it through auctioneers Bonhams. Also shown are other Emidisc double-sided and single-sided acetates and test pressings for sale on eBay. 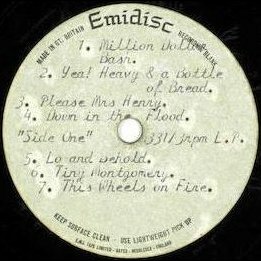 ("Emidisc" was EMI's brand of recording blank, made at Hayes, Middlesex, which could be used by anyone in the recording industry - exactly like a CD-R today - and the name does not mean this recording was produced by EMI itself. 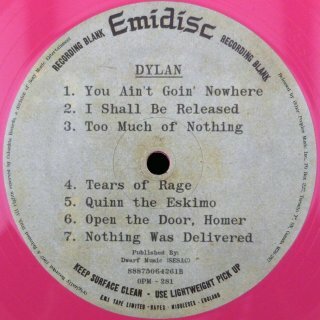 I have other 1960s test pressings pressed on vinyl blanks with Emidisc labels. The single Emidisc acetate of I Shall Be Released is of the track from The Basement Tapes sessions eventually released on The Bootleg Series Vols. 1-3 in 1991, not the later version released on Bob Dylan's Greatest Hits Vol. II in 1971. The title is misspelled "Realeased"! 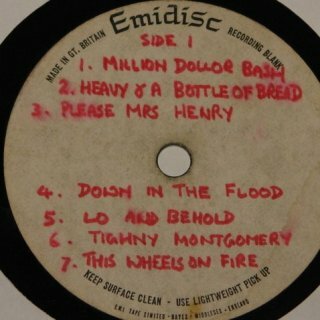 The three other single Emidisc test pressings are all of tracks from the UK LP and later released on The Basement Tapes in 1975. 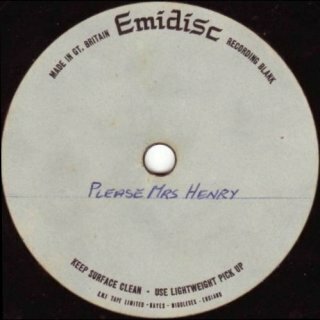 Gerd Rundel's copy of Please Mrs. Henry is blank on the reverse and comes in a grey card sleeve with blue edges. 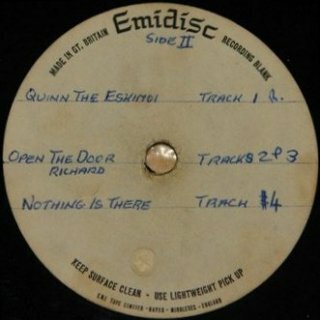 The Emidisc test pressing EP has two takes of Tears Of Rage plus Quinn The Eskimo on Side 1, with Quinn the Eskimo, Open The Door, Richard and "Nothing Is There" (Too Much Of Nothing or Nothing was Delivered?) on Side 2. Front of sleeve scan from johnpeelarchive.com Thanks to Ian Woodward for finding a "Demos" copy of the 14-track album with exactly the same tracklist in a white card sleeve that was owned by the late British "underground" DJ John Peel (John Robert Parker Ravenscroft, 1939-2004). 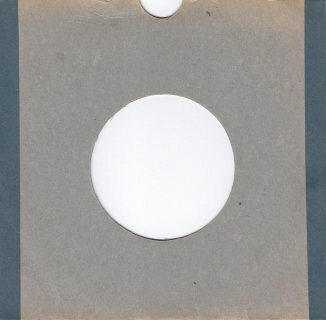 The rear of the sleeve is blank, and the disc comes in a white paper inner sleeve with blank white labels. 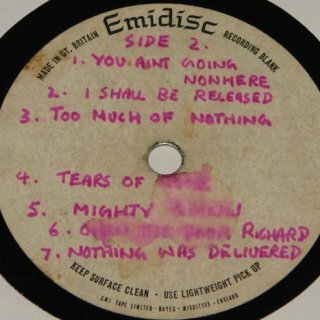 There is an associated record card with a typed tracklist. 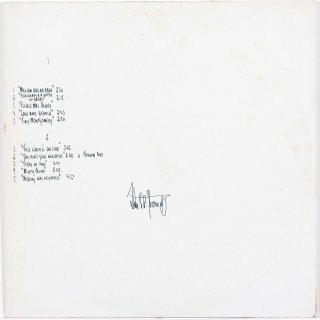 Arie de Reus' acetate of I Shall be Released above was used for the insert of the 2CD release of The Bootleg Series Vol. 11: The Basement Tapes Raw in 2014. 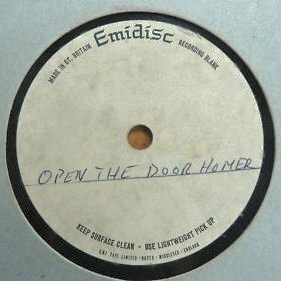 The B-side of this acetate looks as if it had a track cut into it, but it has deep grooves scored across it to make it unplayable. 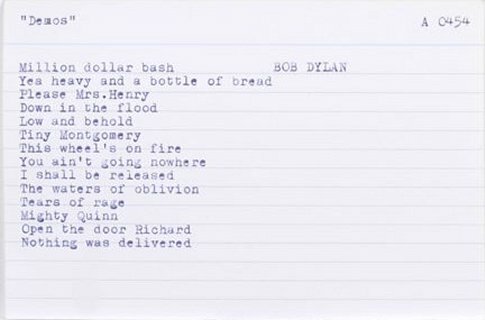 This 14-track album was re-released as The Basement Tape by Other People's Music and Columbia in three versions for Record Store Day 18 Apr 2015! As none of the tracks are now rarities, these releases have been added to The Bootleg Series Vol. 11 - The Basement Tapes Complete/Raw album page here. Arie's UK acetate above was used by Jan Haust as the basis of these 2015 labels. 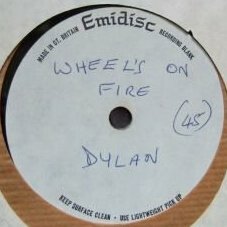 None of the tracks were thought to be rarities, but Peter Coulthard points out that at the start of This Wheel's on Fire Bob is heard to sing/mumble softly "If your mem'ry serves you well..." This fragment of singing ahead of the first strummed note does not occur on the 6CD set The Bootleg Series Vol. 11 - The Basement Tapes Complete. so these albums have also been added to 2015 as containing a rarity. 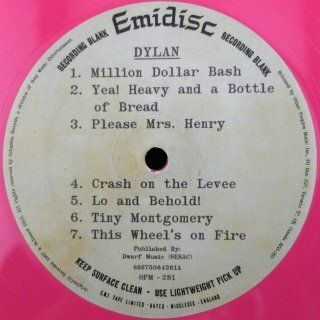 It is possible that this intro also occurs on the 1968 test pressing LP, confirmation required! Thanks to Arie de Reus, Andrew Codd, Gerd Rundel and Wiebke Dittmer for information and scans. 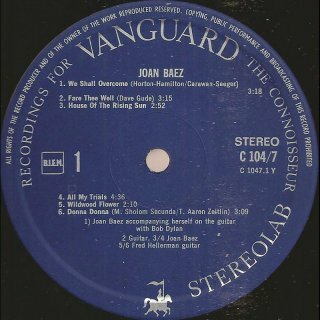 A-side picture from eBay found by Jean-Pol Hiernaux Both songs were eventually released in 1975 on The Basement Tapes, although these are mono versions. 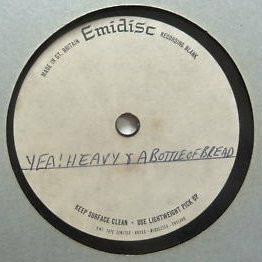 This "Emidisc" test pressing is in a brown paper sleeve which is inside a plain white sleeve. It came from the collection of Denise Mills, PA to Island Records founder Chris Blackwell. Thanks to Jean-Pol Hiernaux for finding this on eBay. 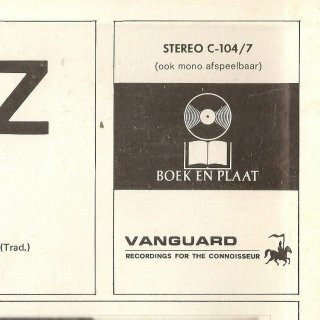 This was an exclusive compilation made by Vanguard for "Boek en Plaat [Book and Record]", a Dutch mail order club. (A different Spanish mail order club with the same name, "DiscoLibro", released an exclusive edition of Desire.) 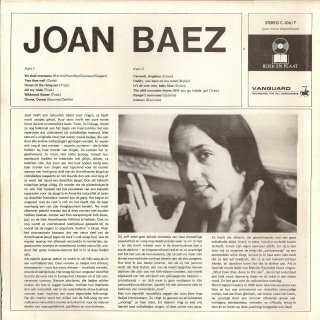 This album has the "Boek en Plaat" logo on the rear sleeve, but not on the record labels, as was usual for records made for this club. It includes three Dylan covers on side 2: Farewell, Angelina, Daddy, You Been On My Mind and It's All Over Now, Baby Blue (tracks 1-3), but the most interesting track on this record is We Shall Overcome (Side 1, track 1) credited as performed by "Joan Baez accompanying herself on the guitar with Bob Dylan". 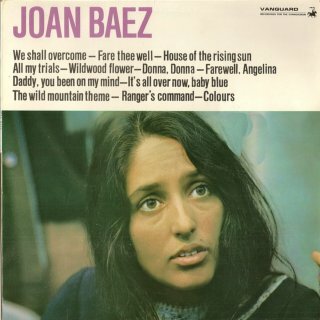 Joan Baez sings and plays guitar, but there is also an ensemble vocal - Bob must be singing background vocals here. 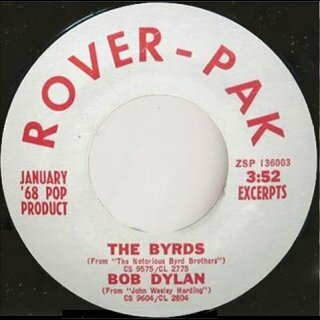 There is no information for this track, but it must be the live performance taken from the Newport Folk Festival. Living In Another Country: International Stereo Releases Stereo promo items for 1968 which don't contain rare material but which are still very collectable are now included with promo releases of regular albums and commercially released singles on the appropriate page in International Stereo Releases.